I see that Fox and I had the same idea! Jane's Twirly was next on my list, so I started it and then saw it appearing on Fox's blog too. 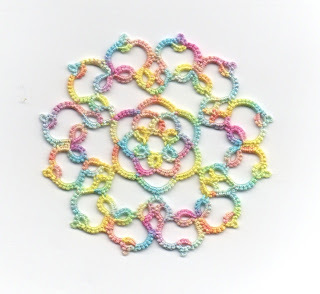 I decided to use Jess's Taffilicious which has lots of pretty colours in it. I love the thread but I don't think it was a good choice for this motif. The colours distract from the pretty shape of it. I find that's often the case with variegated and more often than not, I decide, in the end, that a plain colour would have been better. But there are so many gorgeous variegated threads! I'm always tempted by them. It's just finding the right pattern to best display them which can be tricky. Jane seems to have endless inspiration with all these patterns she comes up with - thank you Jane! I was torn between making Twirly or the latest Ferris Wheel which is neat looking too. Perhaps I'll have to do that one next. Okay - so now I am totally depressed. This is absolutely beautiful! Oh no! Don't say that Fox! Yours will look great in white and blue. Don’t mind me! Just a minor hissy fit! 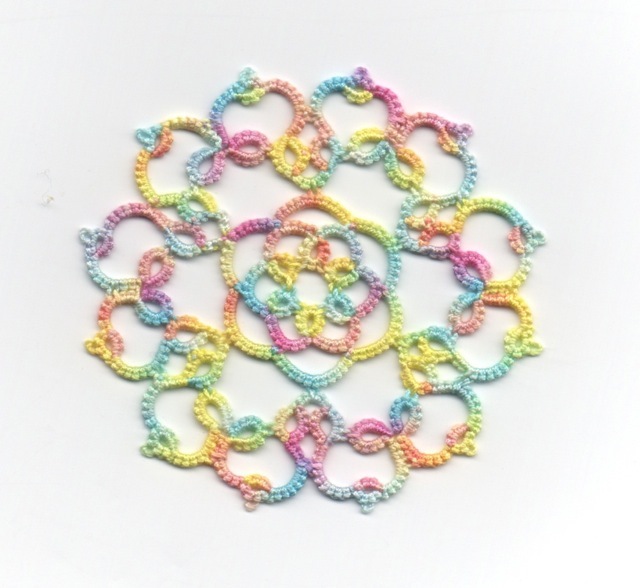 I have had so much trouble ‘getting’ this pattern, but finally I figured it out. I want to tat one in a pastel (yours looks so pretty in those colours) next. Yes, I thought about you while making it... many changes of direction! Beautiful, I have looked at Fox's. and they are both beautiful of course they look different as they are different threads. I have not had time to try this pattern, I have doing a matharon of snowflakes which I finished last night so now I can catch up of a few bits I was doing before I was interrupted with snowflakes. Jane does come up with some fascinating designs! I like the way Twirly turned out, however I do agree that sometimes a design just calls for a solid color to show it off properly. Nicely done! Taffilicious is delicious, and I'm checking out the pattern. Yours is beautiful. Yet More Butterfly... Ornamental Mat?